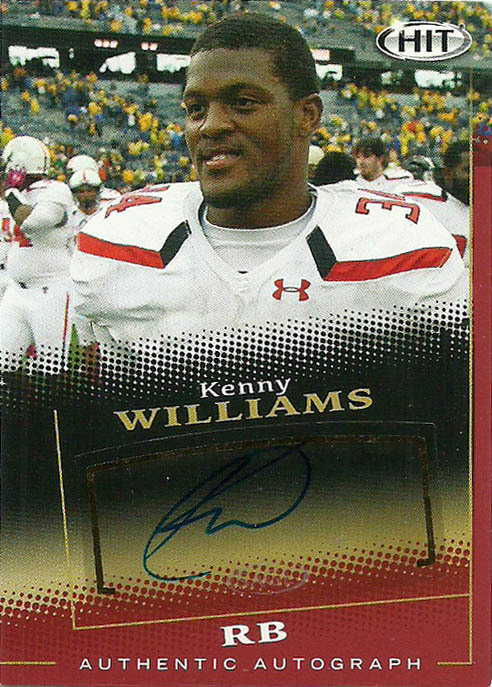 Texas Tech Red Raiders RB Kenny Williams hailed from Pflugerville, Tx- right outside of Austin. He played four years in Lubbock, and had 322 carries for 1534 yards, 16 TDs while displaying a knack for the catch with 60 receptions for 631 yards and 4 TDs- and while he led the team in rushing both in 2012 and 2013, he switched to LB in 2014- the position he played in high school. Undersized (5-9 225), but fast, with ideal athleticism, Williams also was a solid special teams contributor. Scouts still viewed him as an RB and he was tabbed as one for the 2015 NFL draft. He’d go unselected. I think that a guy like Kenny with all the tools to play the game would make a great developmental fit for one of the new spring leagues like the AAF or the new XFL. Time will tell. Josh Atkinson put up solid numbers for the University of Tulsa. In 2015 he had 76 receptions for 1071 yards and 5 touchdowns- one of them going 80 yards to paydirt. He had equally impressive numbers in 2016 recording 78 receptions for 1058 yards and 8 touchdowns from QB Dane Evans. Atkinson ran a 4.64 40, and with the knock he was from a ‘small school’ wasn’t selected in the 2017 NFL Draft. I hope he continues his football career. I think that he’d make a good fit for the Arena Football League or one of its competitors. 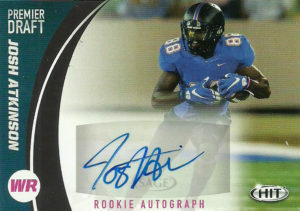 I like this card of Josh a lot. The photo is well placed in the composition, and the highlighted area is a nice touch to really emphasize the autograph. 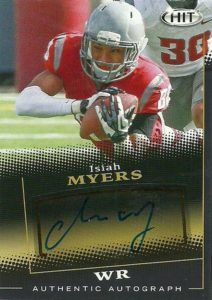 Isiah Myers played for the Washington St Cougars from 2011 to 2014. His numbers grew for the most part every year climaxing in his senior campaign, when he was on the Bilitnikoff Watch List. There Isiah put up 78 receptions for 972 yards and 12 touchdowns. Both his receptions and touchdown numbers are top 3 single game records in school history. His best game however came against Portland State in 2014, when Isiah hauled in 11 passes for 227 yards and 3 touchdowns, including a 55 yard grab. Myers was not selected in the 2015 NFL Draft. His size (6’0″, 188) and average pro day may have worked against him. I was surprised to see that he didn’t apply his trade to the Arena leagues, however currently Isiah is putting his Sociology degree to good use in Florida.